Garfield County, Nebraska Horse Directory - O Horse! Allow us to introduce you to Calamus Outfitters, located on the Switzer Ranch, in the beautiful Calamus River basin of north central Nebraska. We offer a variety of seasonal activities year round. Natural horsemanship camps for youth & women, cowgirl/cowboy camps with cattle drives, trail rides, and internships where you discover more about confidence, leadership, and communication so you can have even more success and fun with your horse. Private riding lessons in Burwell, Broken Bow, Lincoln, Grand Island, Curtis, and Omaha on a regular basis. 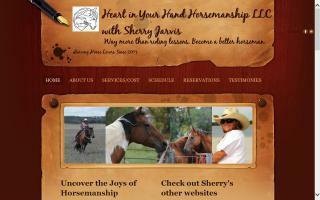 Sherry is a certified instructor with American Association of Horsemanship Safety. She provides safety and training tips in her monthly newsletters and on her blog. Go to her website for further information. There are only two kinds of people: Those who love horses and those who don't. This book is definitely for those who do love horses, whether you own one or not. Sherry's passion and love for horses has driven her to write a book to change your way of thinking and acting so you can win any horse's heart. When a horse gives you his whole heart, he will jump higher, run faster, stop quicker, slide further, spin better, and be safer. Dreams are likely to come true to those who follow the common sense principles presented in this book, with real life stories to support the practices. By reading this book, you can learn what it means to be natural with a horse and how to develop a working partnership. You can gain more knowledge and insight about attitudes, which can help eliminate frustrations with horses. You can discover practical ways to overcome fears, build confidence, and communicate more effectively.